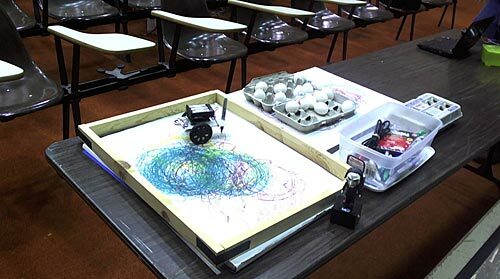 It’s been way too long since I posted anything about the Time Lapse Bot project. Here’s some good background info, if needed. 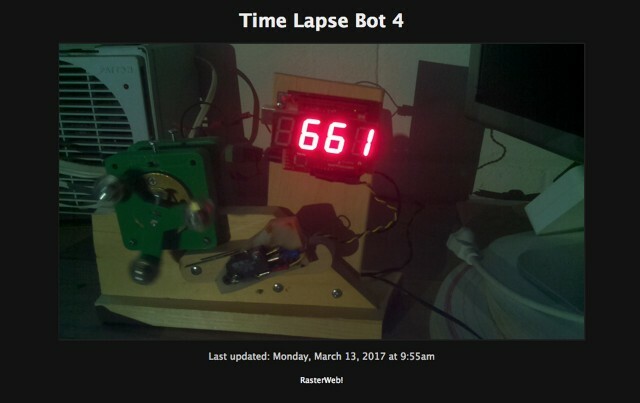 But really, Time Lapse Bot 3 hasn’t changed very much in the past few years… probably because I’ve been working on Time Lapse Bot 4, which uses a Raspberry Pi. 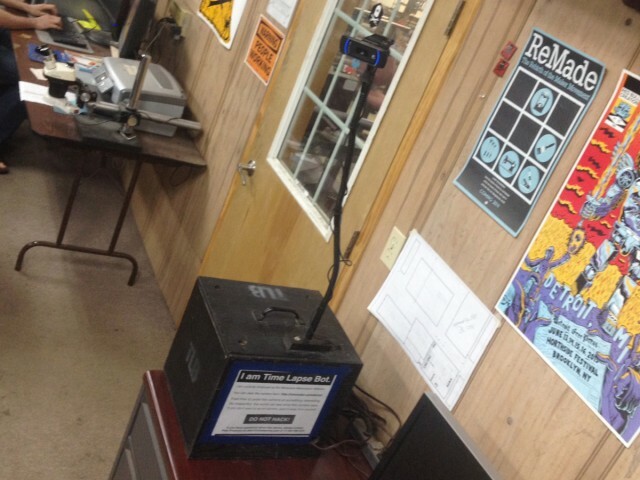 Time Lapse Bot 4.01 made an appearance at Maker Faire Milwaukee in 2016, using a completely hacked together frame on one of my old rolling chair bases, and it worked for the weekend, but I’ve got plans… I’ve got plans. I’ve made a lot of progress with software, and picamera is something I highly recommend! 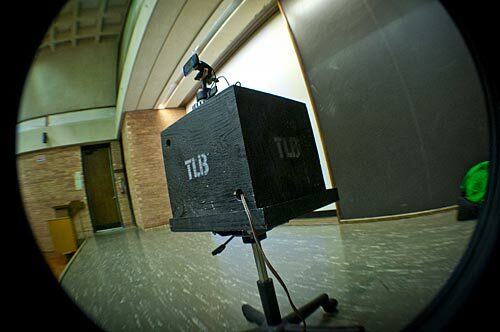 I’ve also got TLBot4 automagically uploading to a server, just like the Milwaukee Makerspace Webcam (running EvoCam, which may be dead now, as the web site of the developer has gone AWOL) and it’s also doing the daily videos compiled from the still images. I’m 90% happy with the software… I mean, the last 10% is the hardest, right? I’m also working on a new physical build of Time Lapse Bot 4, which will feature many mounting solutions, and an interchangeable wide angle lens for capturing crowds. Also, I used the knowledge and experience I’ve gained (especially from picamera) to create part of a museum exhibit that has been running trouble-free (knock on HDPE!) since November. Huzzah! 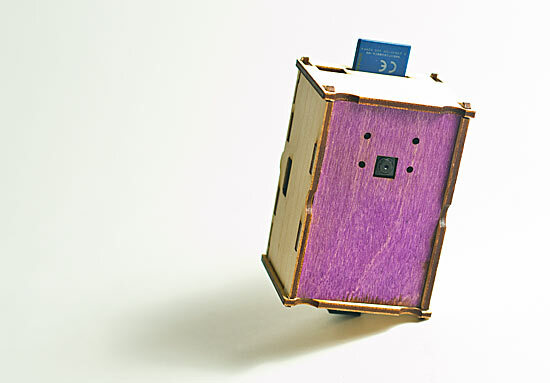 This ‘CameraPi’ is a prototype for Time Lapse Bot 4, and if you’re not familiar with my time lapse hardware experiments, check out the Time Lapse Bot project page for a good introduction. My Time Lapse Bots have always relied on old computers, and while you can typically get old computers pretty cheap, they are also, well… old. They run old software, they often have hardware failures, non-working batteries, are heavy, and a lot of other things that are (sometimes) fine, but sometimes annoying. 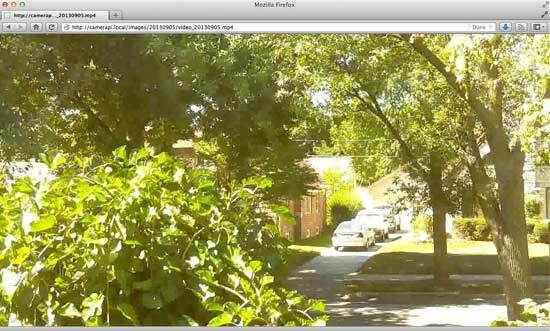 Enter the Raspberry Pi, a small, inexpensive, low-power, modern Linux computer that can use an add-on camera module to create an all-in-one solution to time lapse captures. This is the kind of stuff I love playing with! So here’s the story of making the CameraPi. I’ll avoid getting into code at this post and just talk about the process and some applications. At raspberrypi.org I grabbed the NOOBS install, mainly because I wanted to test it out, and it worked well! I went with Rasbian. I think it had all the camera software baked in, but if not, it’s easy to add. 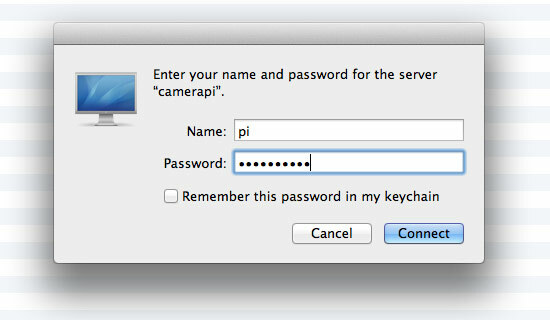 Once up and running, I added Avahi to give the Raspberry Pi a nice network name (camerapi.local) and I also installed Netatalk to allow my Mac OS X machines to easily connect to it. Neither of these are required for the camera stuff, but I tend to drop these on most Linux machines I use. 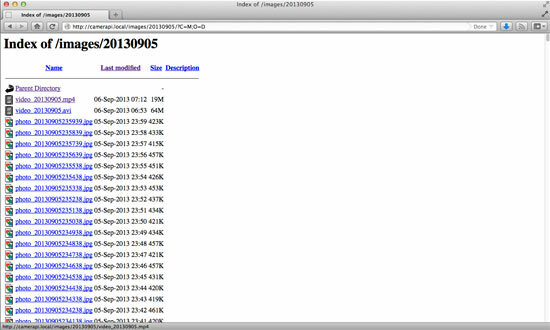 I wrote a simple bash script to capture a new image every 60 seconds. You can set whatever interval you like, but I like 60 seconds. 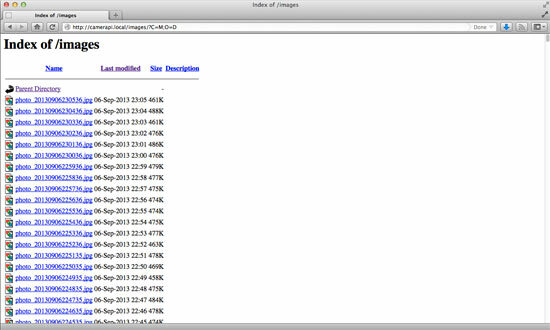 For one day that gives you 1440 images, if you’re keeping track at home. Depending on your image size and compression settings that could be over 1GB per day of still images. 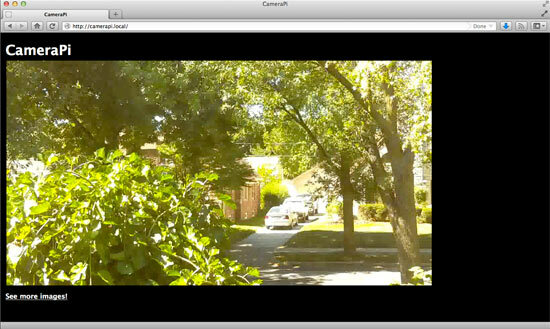 I’m currently using 1280×720 for my image size, as that works well when compiling video. Now we’ve got a folder named 20130905 with 1440 images in it. We should probably do something with it… Make a video! Once the files are moved we run a command with mencoder to compile all the JPG files (sorted by name, which is also sorted by date) into an AVI file. I don’t really care for AVI files though, so when that is done (and, it takes about 6 hours due to the high-quality encoding settings I use) we then use avconv (which used to be ffmpeg, sort of, oh, Linux!) to convert the AVI to an MP4 file. That does not take hours. This is all messy and could be done better. So after all that, we now have an MP4 file we can view in our browser, though it’s a silly MP4 that needs to completely load before it starts. Silly! There must be a better way. Yes. There must be a better way. I’m sure there is. Here’s the thing. I really just started hacking. I didn’t know where I was going, so it’s all been guessing and trying things along the way. That’s the beauty of it. I’m not building this for a client. I’m not building a commercial product. I’m just playing and learning. I love it. Oh, I forgot, I also set my capture script to launch at startup as a service. That means it also stops cleanly when you halt the system. Also, you can halt the system via another CGI just by loading a web page. Secure? Probably not. Ideally I’d like to be able to have the Pi create a WiFi network I can attach to from my phone and control. That would be nice. I’m sure it’s doable, I just need to dig in more. Dig. In. More. Well that was fun! Thanks for reading this. If anyone really wants more info on the code, I could clean it up a bit (or not) and post it. As always, improvements are very welcome. Update: Here’s an example video. First off, I will shout out a big thanks to Jason Gullickson, his wife, Wayland Academy, the Beaver Dam Makerspace Project, and anyone else who helped organize the event and made it happen. 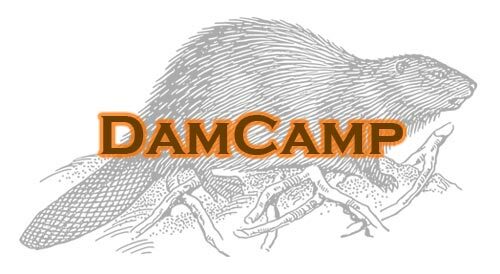 This was the smallest BarCamp I had ever been to… and that isn’t a bad thing. 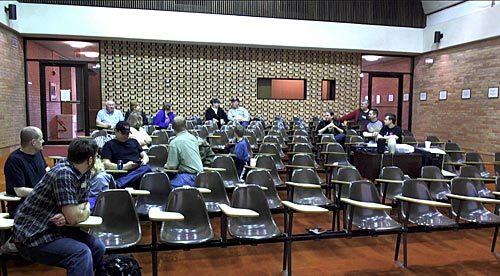 I remember times in BarCampMilwaukee history when some people were very focused on the numbers, and personally, I prefer quality over quantity. If the right people are there, that’s better than more people being there. I saw people I knew who I haven’t seen in a while, met some new people, and met people IRL that I’d only met online before. What more could you ask for? In conclusion, I had a good time, and I learned things. It was a small event, but I don’t think that detracted from it at all. In fact, I wouldn’t mind seeing more smaller events. BarCampMilwaukee is big, and it’s awesome, but it’s also a lot of work, involving a lot of people. Perhaps both ends of the spectrum can co-exist. Time Lapse Bot was at BarCampMadison4 (aka MadCamp) on August 27, 2011, and I forgot to put this together until this week. You may notice I used the same music as last time. Well, so goes it. Enjoy the video! This video is released under a Creative Commons Attribution License. The music titled “Freedom (Techno Plano Mix) ” is from Gurdonark via ccMixter and has a Creative Commons Attribution Noncommercial License. You can also find this video at Vimeo… Enjoy! Can’t all the robots just get along! ?